Go to original pattern for design DROPS Extra 0-1362. Felted slippers with stripes, worked from the toe backwards in DROPS Lima. Sizes 35 - 42. 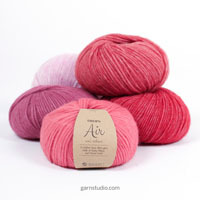 NOTE: If the slippers are worked in one colour, there will be sufficient yarn with 100-100-150 g Lima. 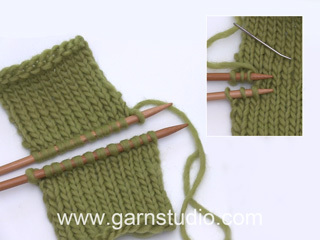 DROPS DOUBLE POINTED NEEDLES SIZE 4 MM – or the size needed to get 21 stitches and 28 rows stocking stitch on 10 cm in width and 10 cm in height before felting. After felting: 23 stitches and 32 rows stocking stitch on 10 cm in width and 10 cm in height. 1 ridge = 2 rounds. 1 round knit and 1 round purl. 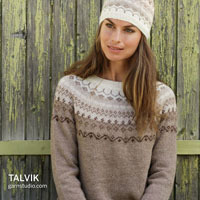 1 ridge = 2 rows knit. Work * 1 ridge off white, 1 ridge grey *, repeat from *-* to finished measurements. 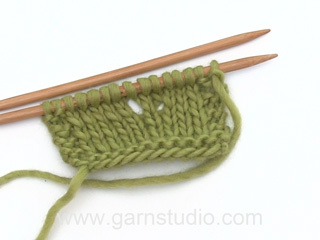 Increase 1 stitch by making 1 yarn over, on the next round knit the yarn over twisted to prevent holes. The piece is worked in the round from the toe backwards, then work back and forth over the heel. Sew together mid back and mid front of the toe. Cast on 28 stitches with double pointed needles size 4 mm and grey. 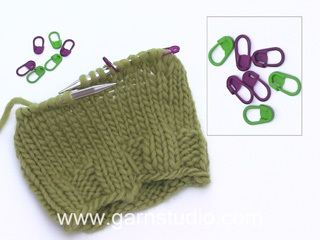 Knit 1 round and insert 1 marker in the first stitch and 1 marker in the 15th stitch (= the sides). Continue with stocking stitch AT THE SAME TIME as, on the next round, you increase 1 stitch on each side of both markers (= 4 stitches increased on the round) – READ INCREASE TIP! Increase in this way every 2nd round 3-4-4 more times, then increase 1 stitch before each marker (= 2 stitches increased on the round) 0-0-1 times = 44-48-50 stitches. REMEMBER THE KNITTING TENSION! 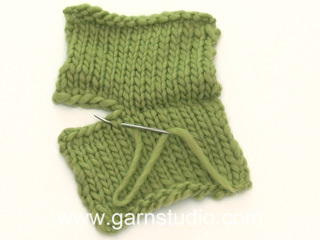 Continue working stocking stitch until the piece measures 13-14-15½ cm. Work 2 RIDGES in the round – see description above, AT THE SAME TIME as you insert a marker mid top of foot after the first 11-12-13 stitches. Cut the strand. Start after the marker (from the right side) and work STRIPES and RIDGES back and forth – see description above. Cast off when the piece measures approx.26-28½ -31½ cm (let the strand end be approx. 20 cm long, this is used for assembly). Fold the casting-off edge double and sew together mid back – sew in the outermost stitch so that the seam is not too thick. 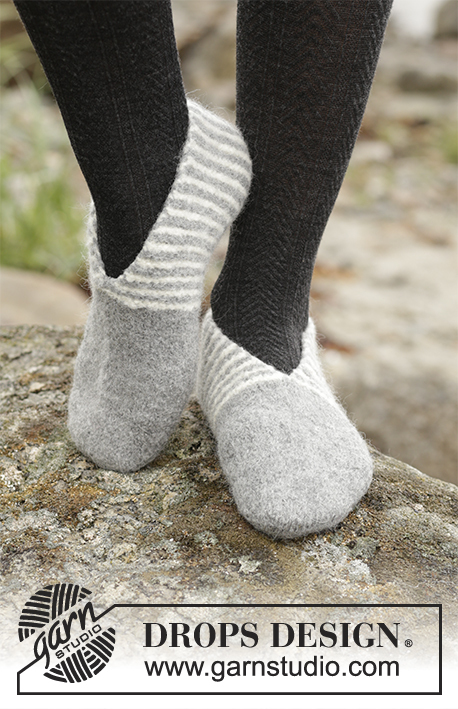 Sew together the hole at the front of the toe with graft stitches in grey – sew the 14 stitches on top of the foot with the 14 stitches under the foot. Work another slipper in the same way. Put the slippers in the washing machine with a detergent without enzymes and optical bleach. Wash at 40 degrees with the normal centrifuge and without pre-wash. Afterwards, put the slippers on your feet and shape them to the right measurements while they are still wet. Later, wash the slippers as normal wool garments.